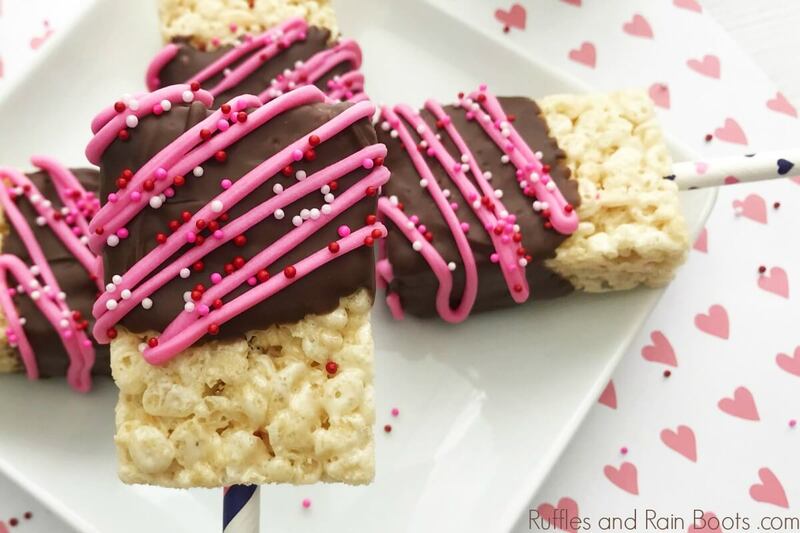 These easy Valentine’s Day rice cereal treats put Rice Krispies to great use. And the best part is they are done in no time and gobbled up just as fast! Here at Ruffles and Rain Boots, we’re breaking out all the pinks, reds, and heart-shaped anything we can find. Although it’s not for everyone, my little one loves this holiday. She is in first grade and Valentine exchanges and classroom parties are still a thing. If you have a class party to cater, these Valentine’s Day rice cereal treats are sure to be a crowd-pleaser! 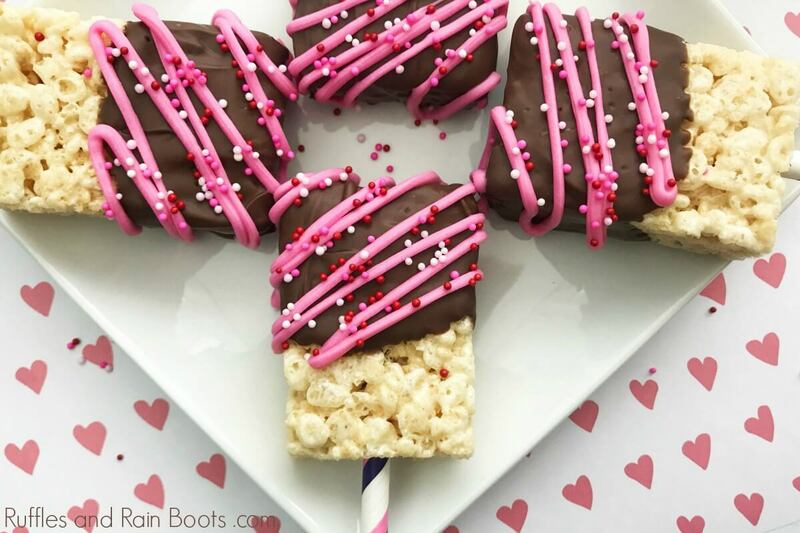 We make quite a few Rice Krispies treats around here and this is such an easy Valentine’s Day dessert idea for kids. The best part is that they can actually join in on the creative fun! Below are a few things you need on hand to whip up a batch. You might also want to use a sandwich bag or a decorating bag for the candy (like we did). You can also just drizzle with a fork, too. We’ve made a gazillion batches of rice cereal treats (slight exaggeration) and here are a few tips to keep in mind. Rice Krispies treats in fun shapes will bring ALL the smiles. If you’re making these for a class party or as a party favor, be sure to pick up these clear bags and ties – makes it safe and easy. This is the first time we used premade Rice Krispies treats – did you know you can buy Rice Krispies treats in sheets?! Note: not gluten-free. 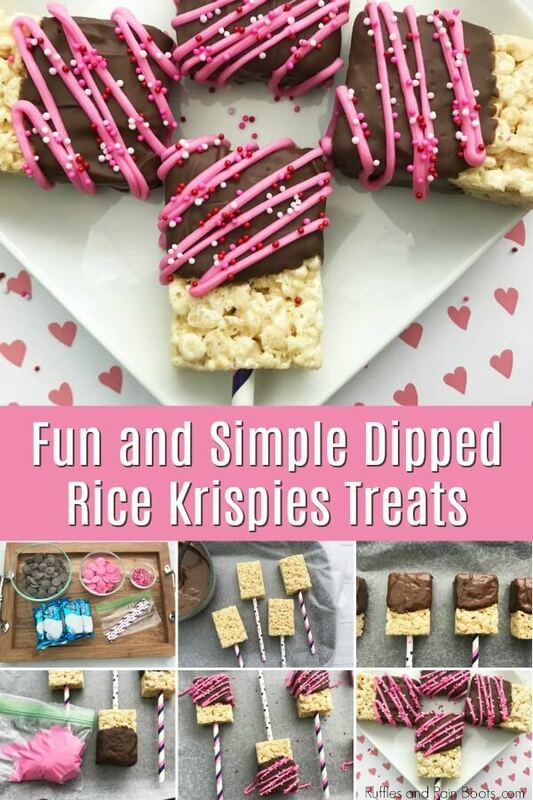 Click here if you need a small batch gluten-free Rice Krispies treat recipe or a large-batch Rice Cereal Treats recipe. Track down gluten-free chocolate, however. And if you have someone with celiac disease, avoid candy melts as they are not parts-per-million tested. 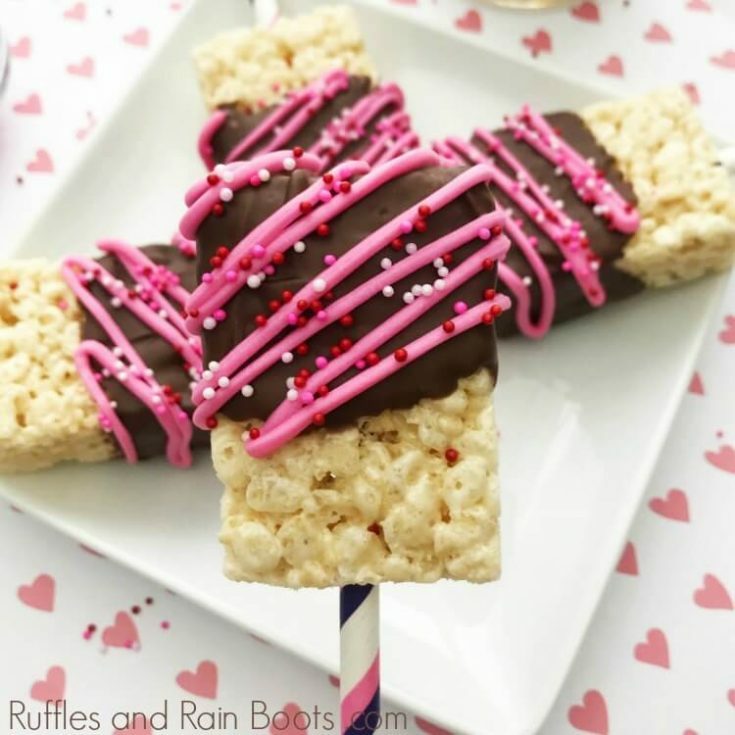 These easy Valentine's Day rice cereal treats are a crowd-pleaser! The dipped treat makes it a blast for the kids to help with, too. Unwrap each Rice Krispies treat and press a straw or lollipop stick through one of the short ends. Place the treats on the baking sheet and chill. Place the chocolate candy melts in a microwave-safe bowl and melt per package instructions. Hold a Rice Krispies treat over the melted chocolate and use a spoon to coat one half. Let any excess chocolate drip back into the bowl and set the coated treat on the baking sheet to set. Melt the pink candy melts and drizzle over the chocolate (you can transfer the candy to a sandwich bag or just use a fork). Add sprinkles while the candy is still wet and set aside to dry. 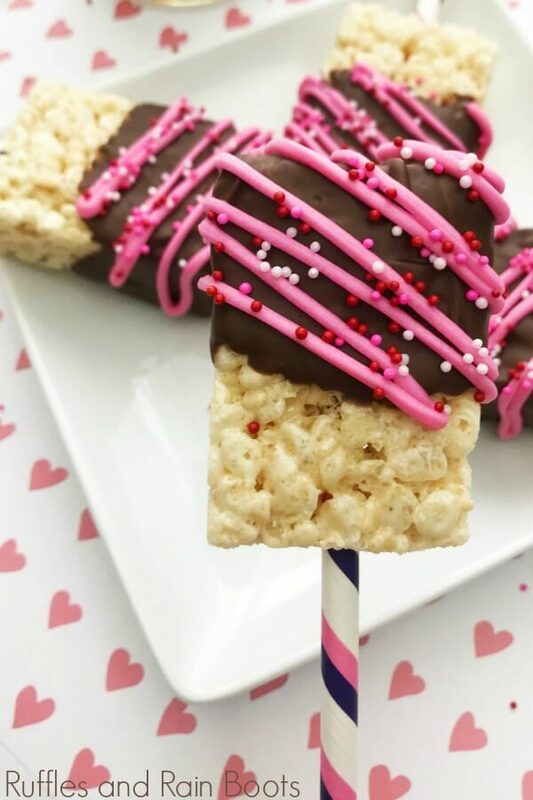 Serve your fun Valentine's Day rice cereal treats in a bouquet-style on a desserts table. Be sure to wrap each one if you're using them for a class party. 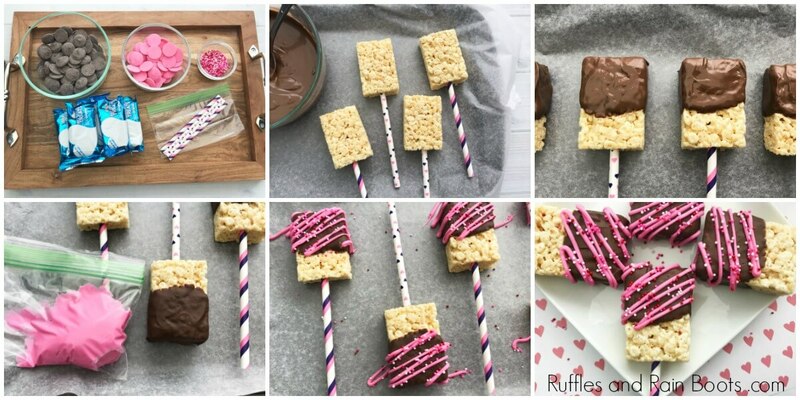 If you want to put this easy Rice Krispies treats to the test, here are a few more fun ideas. Everyone just loves munching on them, so save these to your favorite treats board on Pinterest. Iced Rice Krispies Treats – Easy? Yes. Fun? Yep. 100% customized for any occasion? Check.